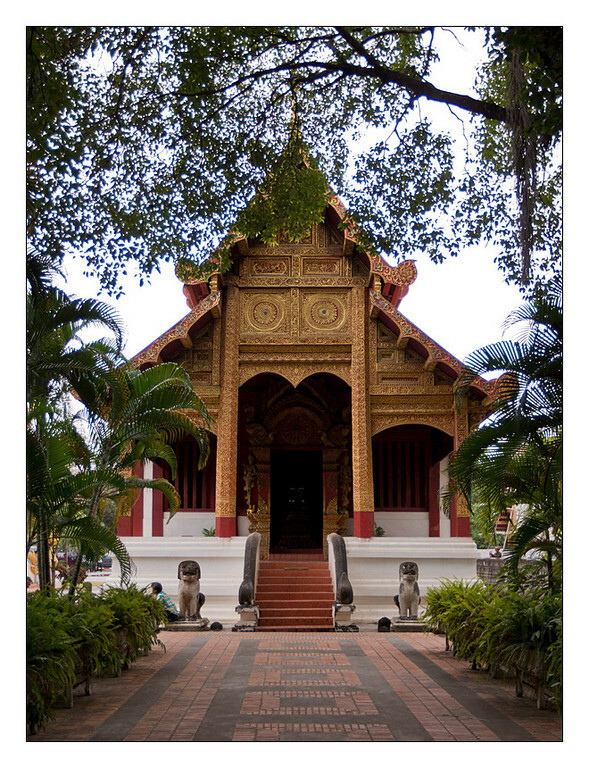 Today Brad wanted to laze around our suite and read so I headed off into the Chiang Mai's old city to explore. It was an early start and I wanted to wander around until the Saturday Walking Street where they close off a street and it is populated by artists and purveyors of Thai street food. Most of the old city is difficult to differentiate from the outlying areas except for the fact that it is surrounded by portions of a crumbling ancient brick wall. 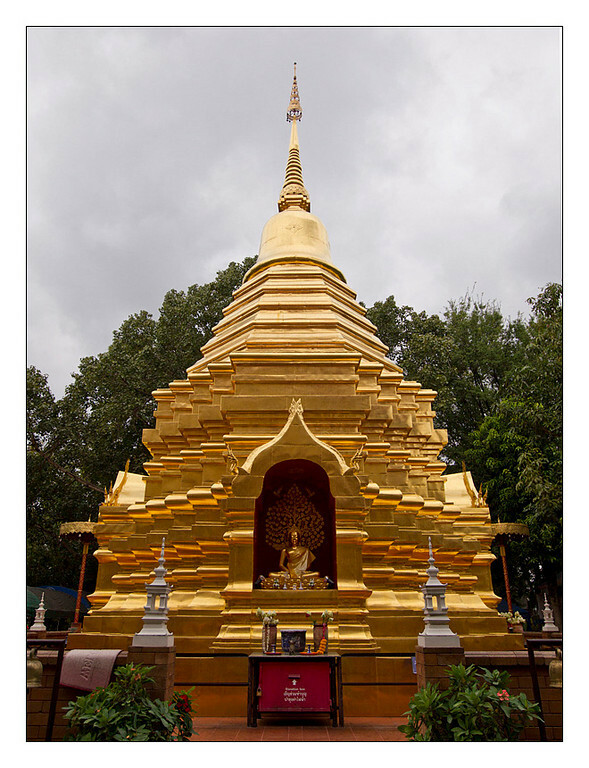 What makes it different from the rest of Chiang Mai is that in between the shops, restaurants and trendy hotels are littered dozens of temples. 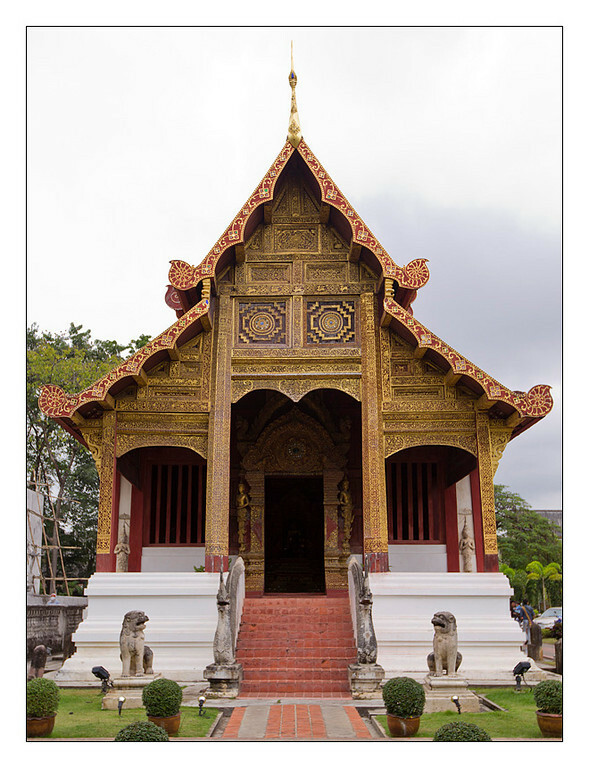 Each temple is surrounded by a complex of smaller buildings and there are monks who have rooms somewhere on the grounds of almost all of them. 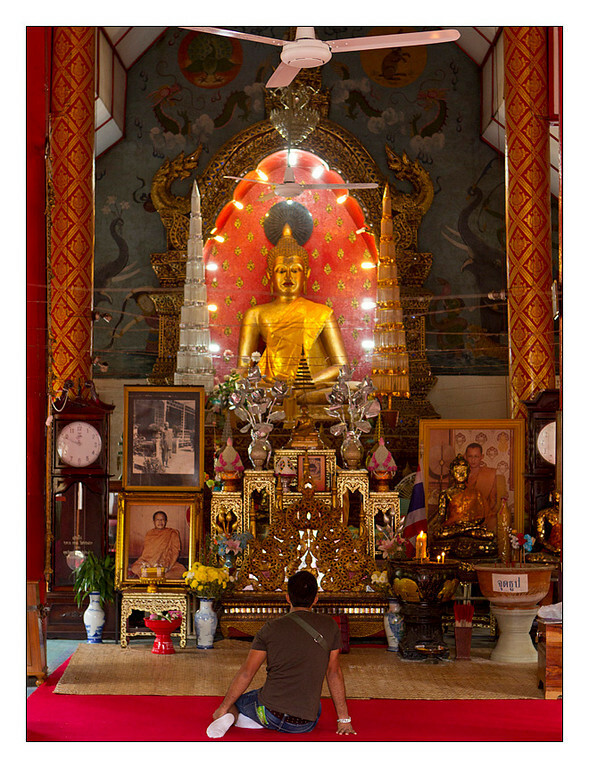 In Thailand almost every boy spends a little time in the monastery learning the fundamentals to obtaining inner peace and getting a better understanding of what it means to be a good person. 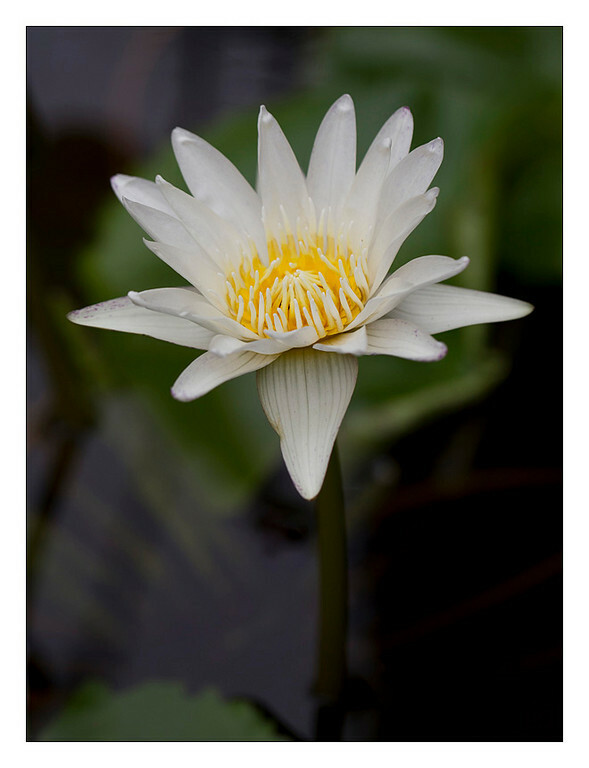 Many consider it to be good luck to have a monk in the family. 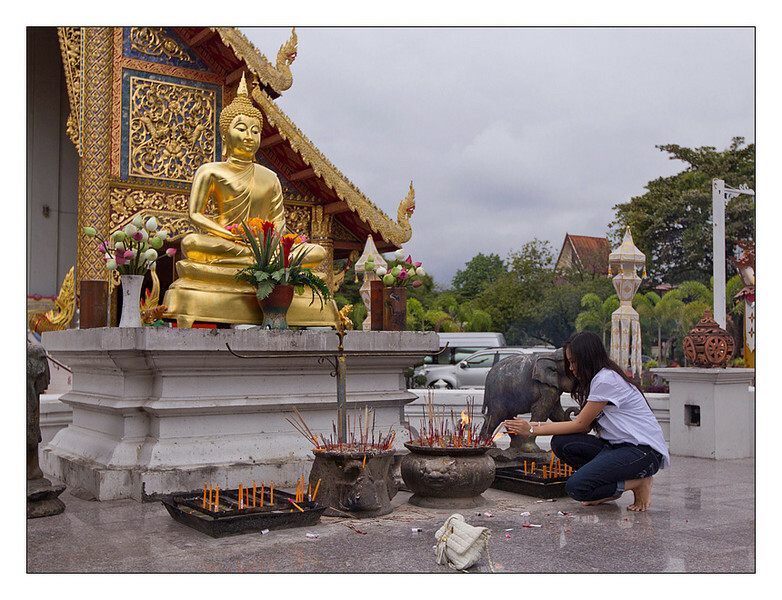 Lighting candles and incense outside Wat Phra Sing. 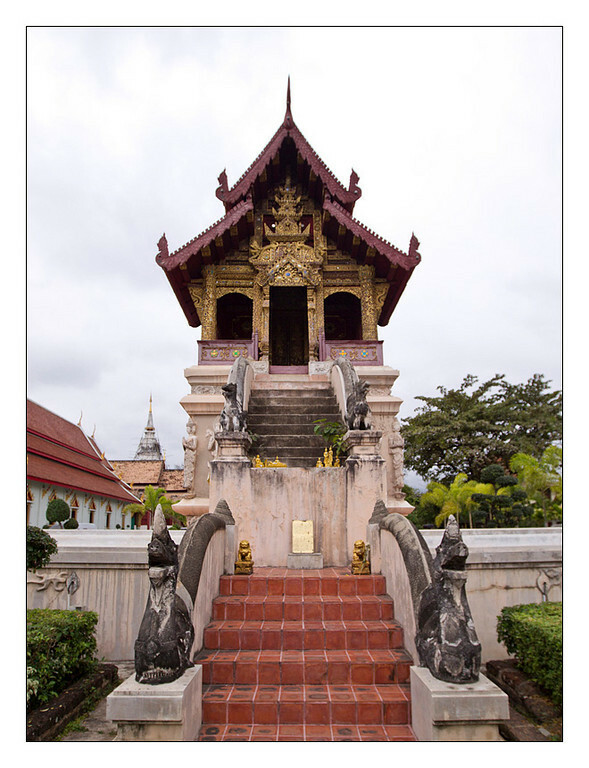 Another temple on the grounds of Wat Phra Sing. 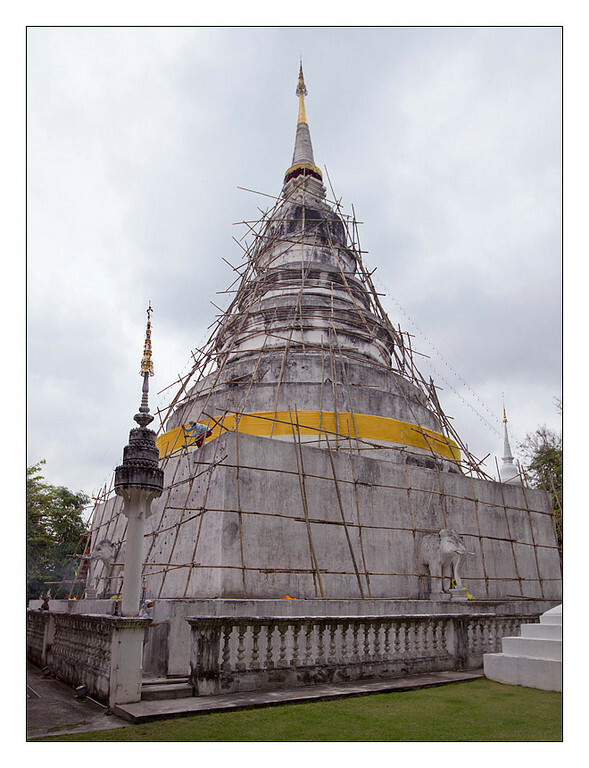 This used to house the Emerald Buddha that is now in Bangkok. 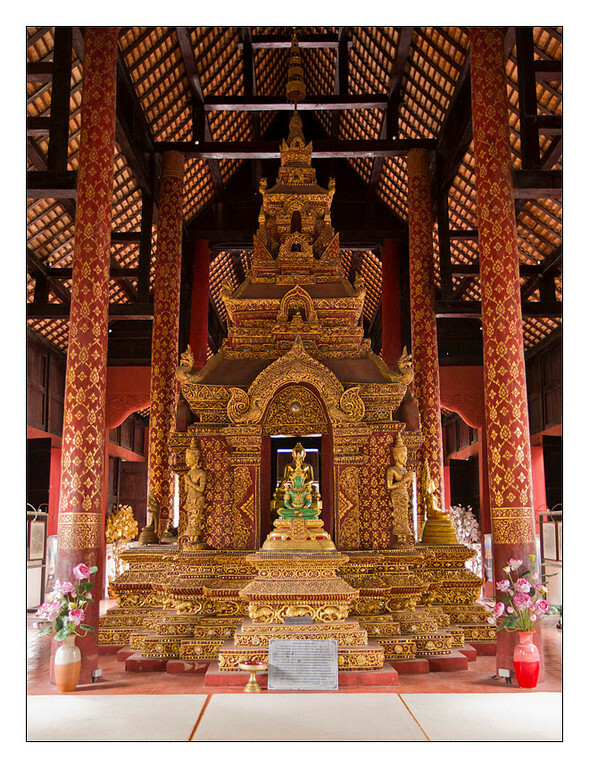 The interior of the temple shown above. 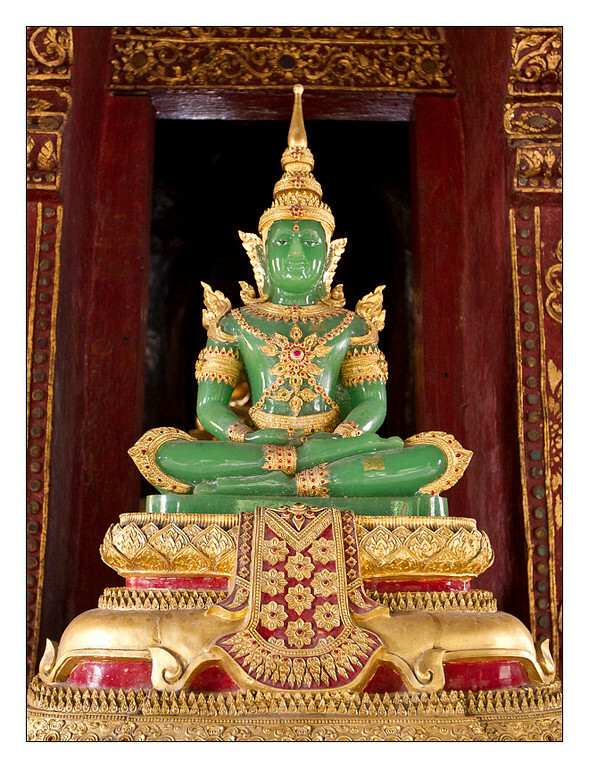 The King commissioned this jade Buddha to replace the Emerald Buddha. 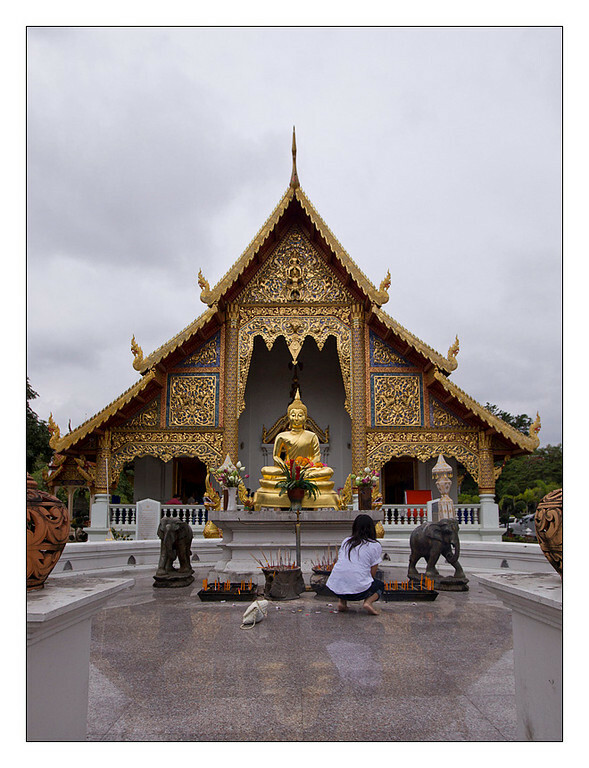 Still on the grounds of Wat Phra Sing. Yet more temples on the ground of Wat Phra Sing. I believe this is Wat Chai Prakiat. 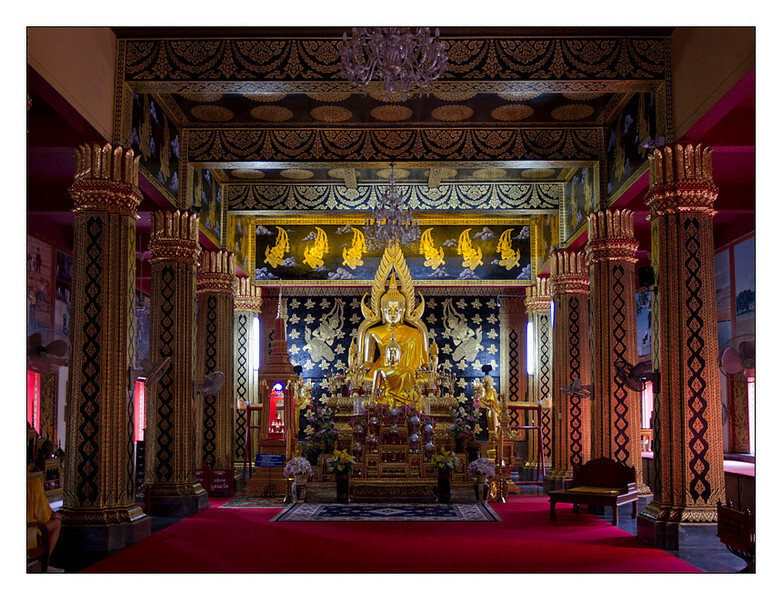 The interior of Wat Chia Prakiat. 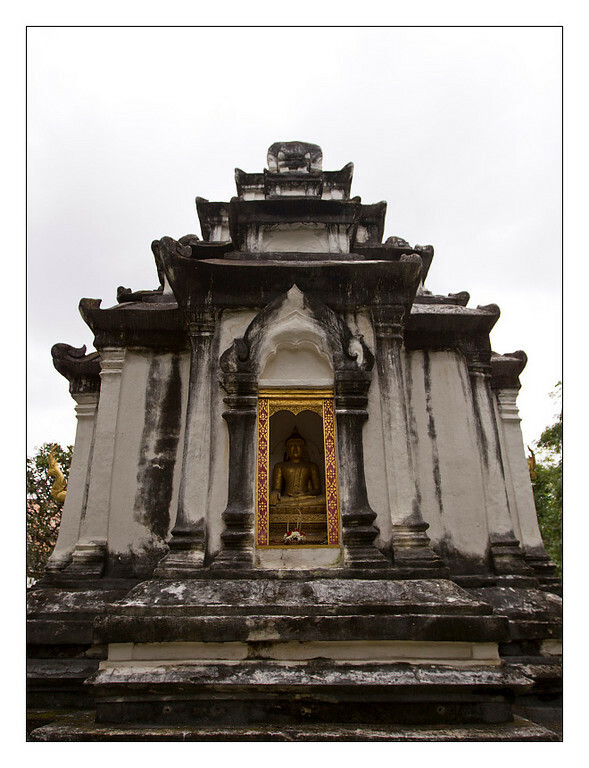 The Buddha inside Wat Phan On. 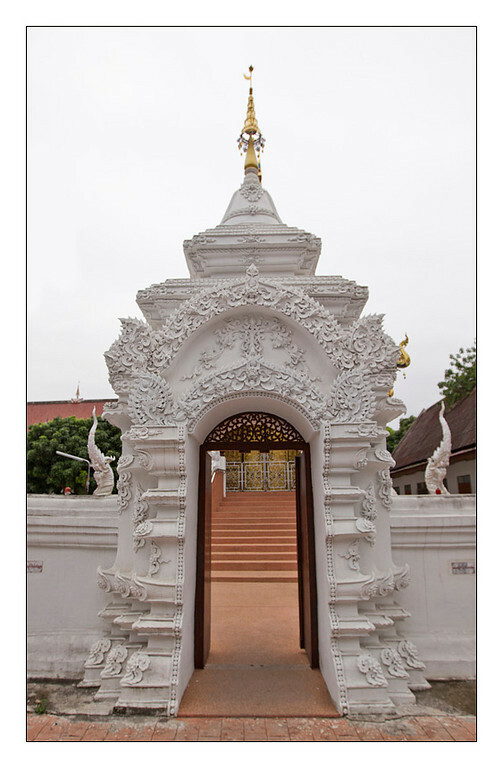 A gate to a temple that I could not find a name on that was in English, I suspect it is Wat Chedi Luang from what I can remember of its placement compared to my map. 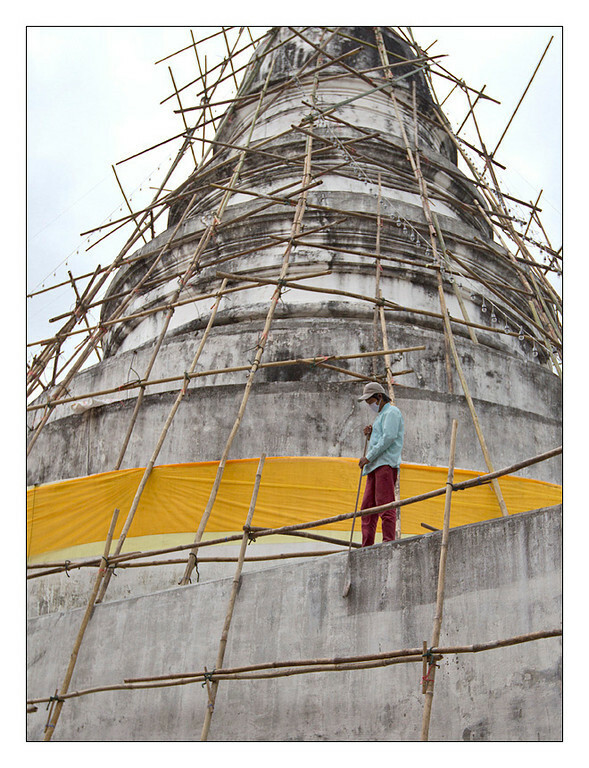 The Sareerikkatartsirirak Pagoda. Yes, I took a picture of the plaque outside and that is the proper name in its entirety. A family being blessed by a monk. 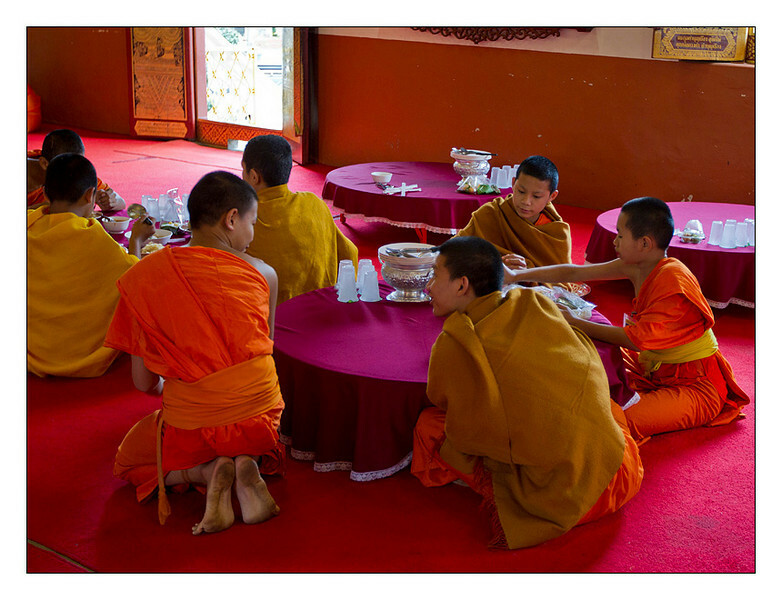 Young monks getting ready for lunch. 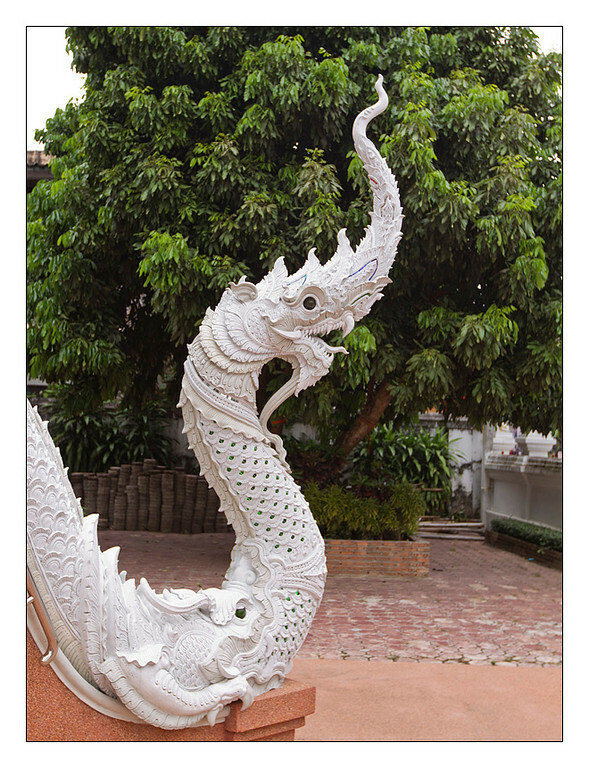 A serpent coming out of what I believe is the mouth of a dragon outside the entrance to a closed temple. Old crumbling plaster and cement is being scoured away to be replaced. 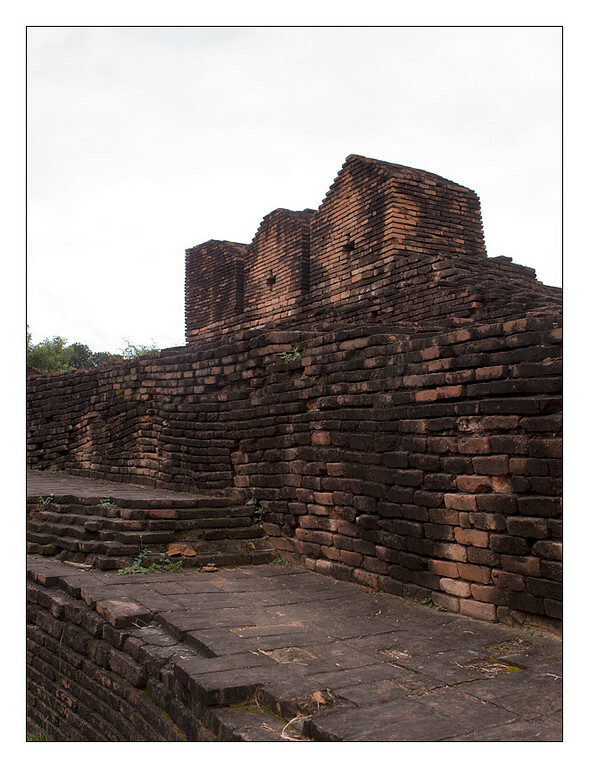 But Chiang Mai isn't just temples. 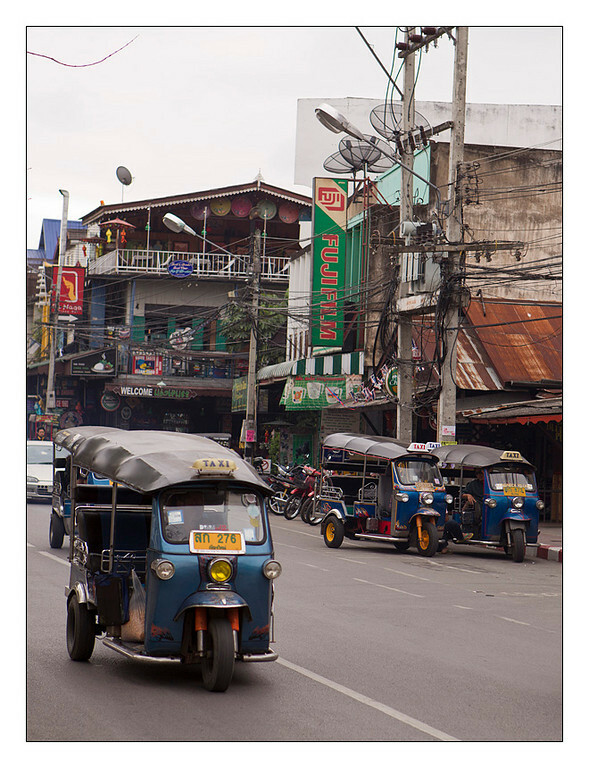 The streets are bustling with cars, tuk tuks and motorbikes. There are people selling food from carts all over the city and there are also regular businesses that cater to the people who live in this city, not just visiting. 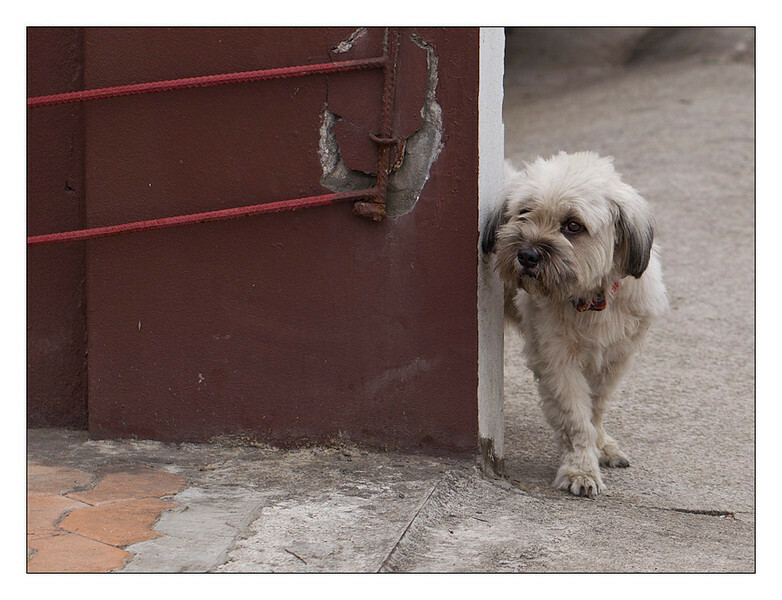 Despite being the second largest city in Thailand it feels more manageable, less congested and infinitely cleaner. 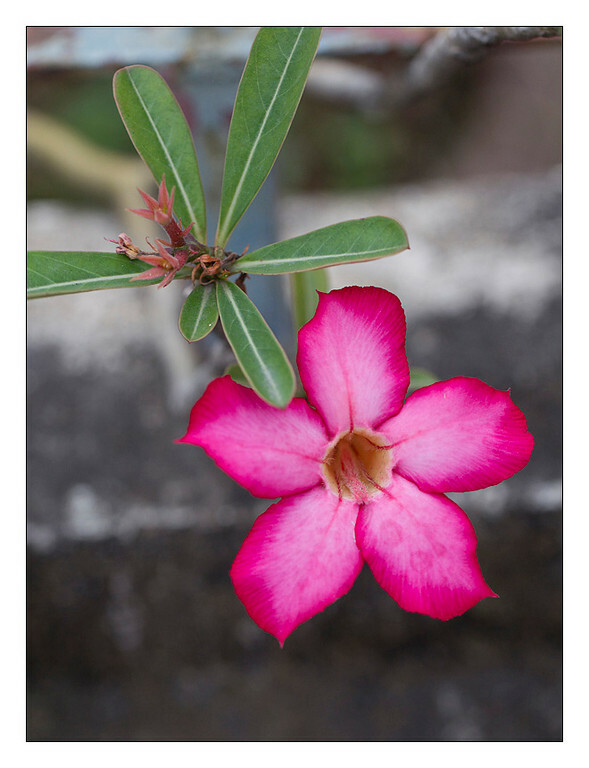 What's more, I found an abundance of flowers as I wandered down the streets of the old city. 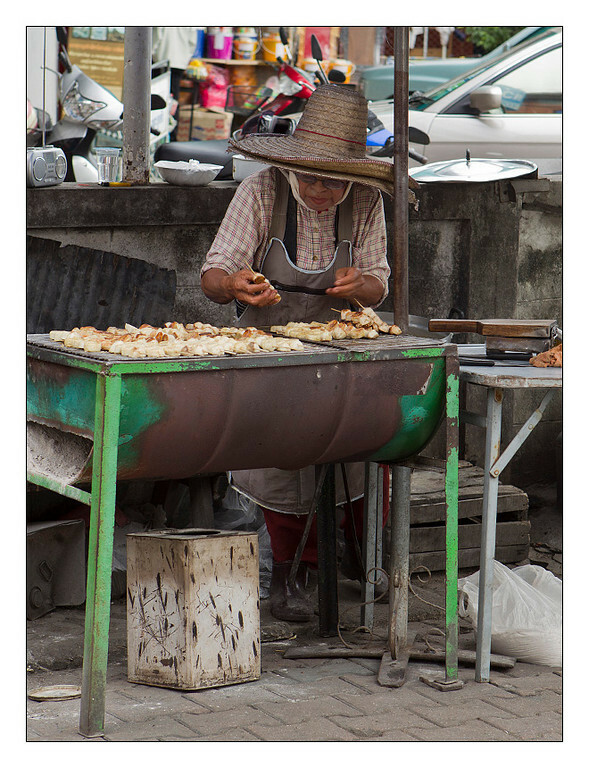 The banana lady selling smooshed grilled bananas on a stick. 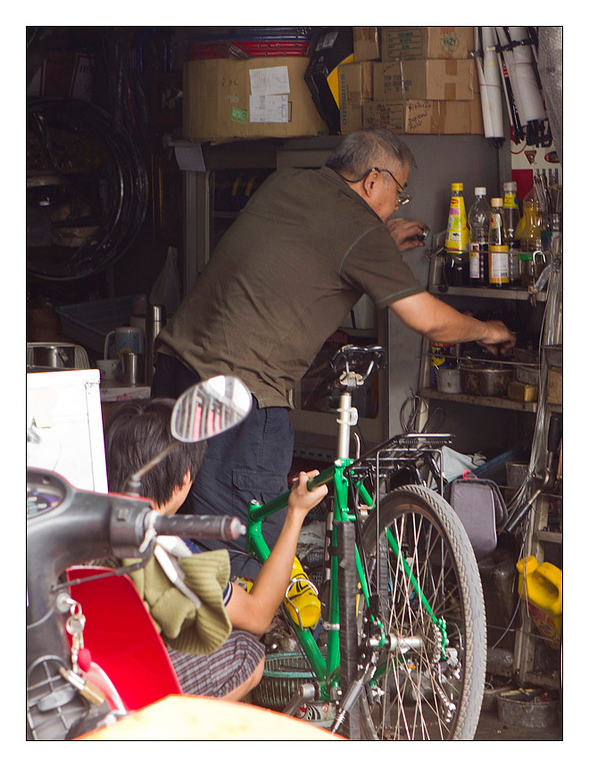 Despite what appear to be condiments on the top shelf, this is a bicycle repair shop. 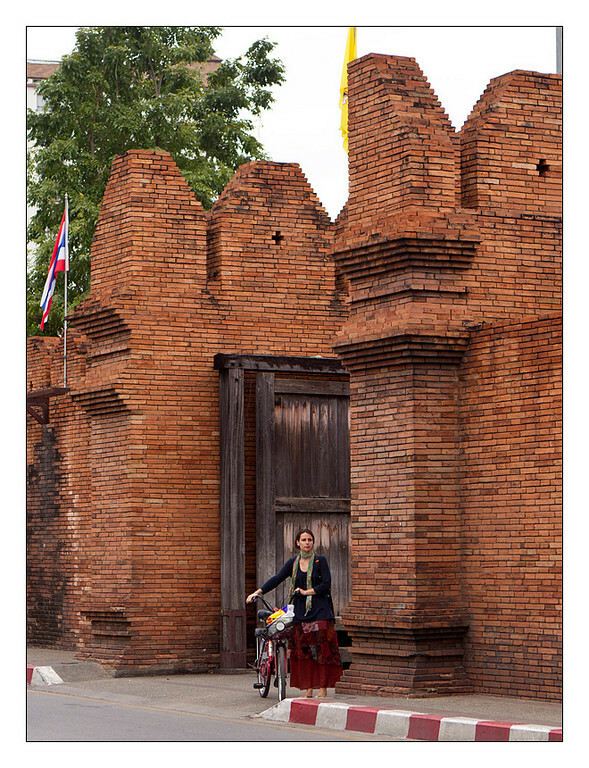 A woman biking through a section of the old wall surrounding Chiang Mai's old city. 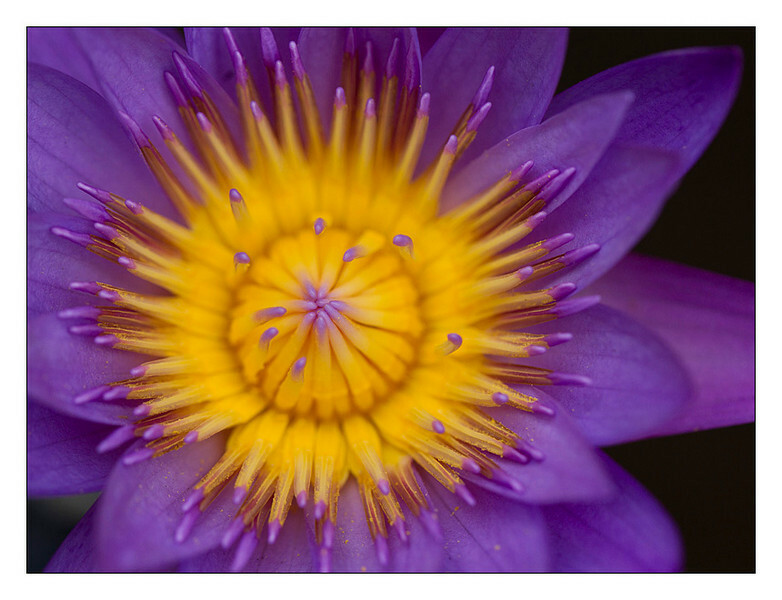 The flower of the water lily. 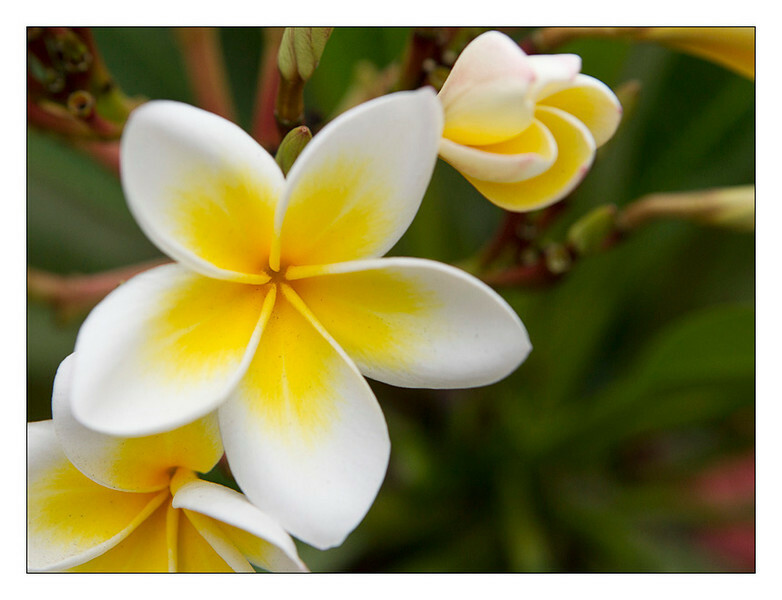 Laura will remember the sweet scent of the frangipani or plumeria. 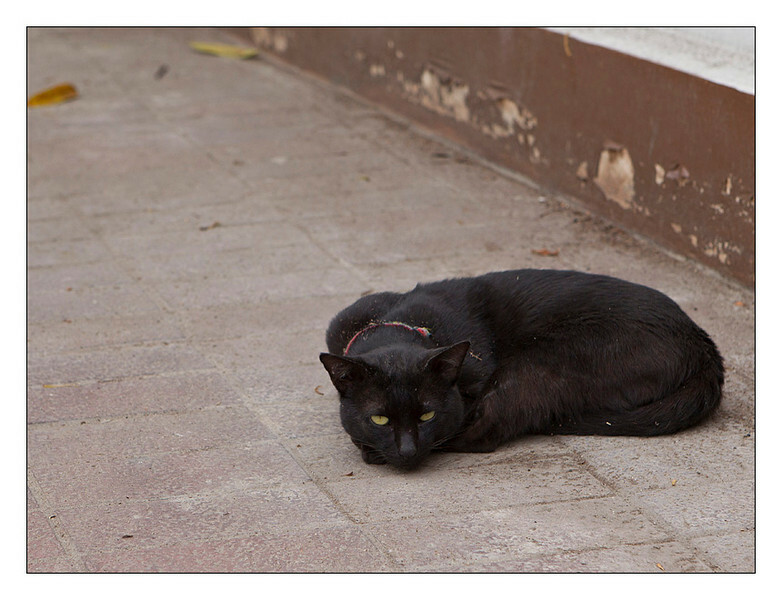 A cat soaking up the warmth from the sidewalk (I wouldn't think that would be necessary). 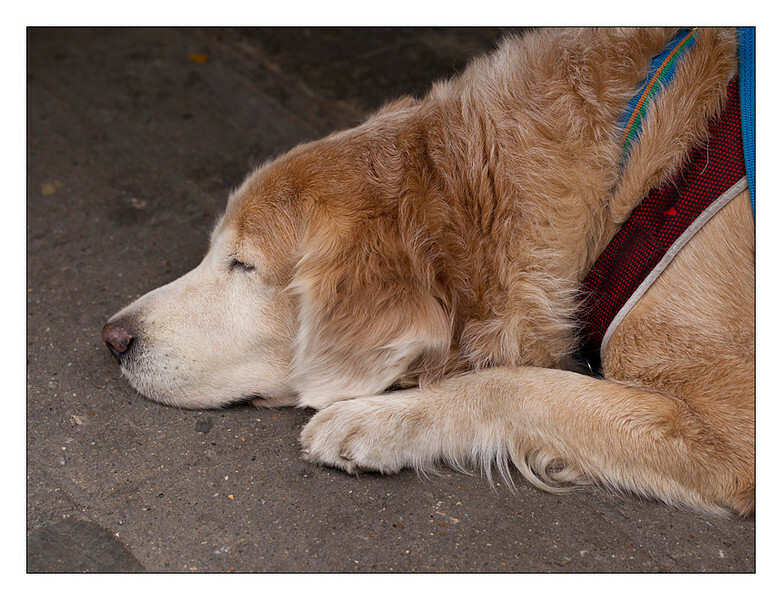 I was a little surprised to find a golden retriever in the entry of a shop. Finally I approached Wualai Road, renown for its silver smiths and the location of the Saturday Walking Street. The vendors were just getting ready and beginning to set up right as I was getting ready to call it a day. 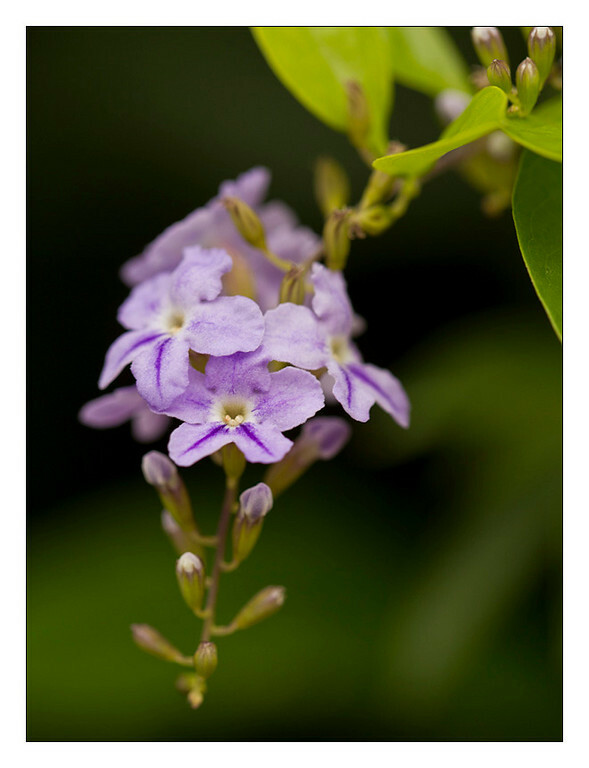 I had been wandering the streets of Chiang Mai for the better part of six hours so I was ready for a shower, a meal and my bed. 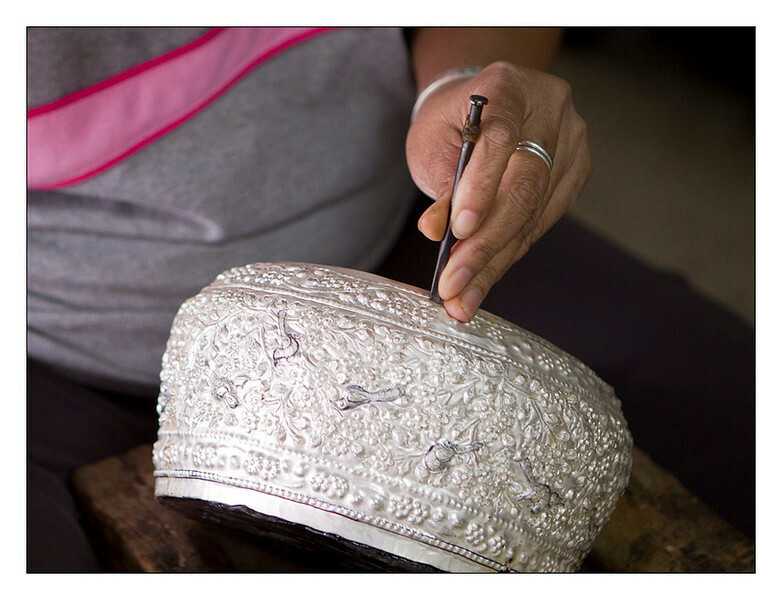 An artisan working carefully to emboss a scene into a silver bowl. When I returned via tuk tuk to my accommodations Brad and I talked it over and decided to eat in the on-site restaurant. 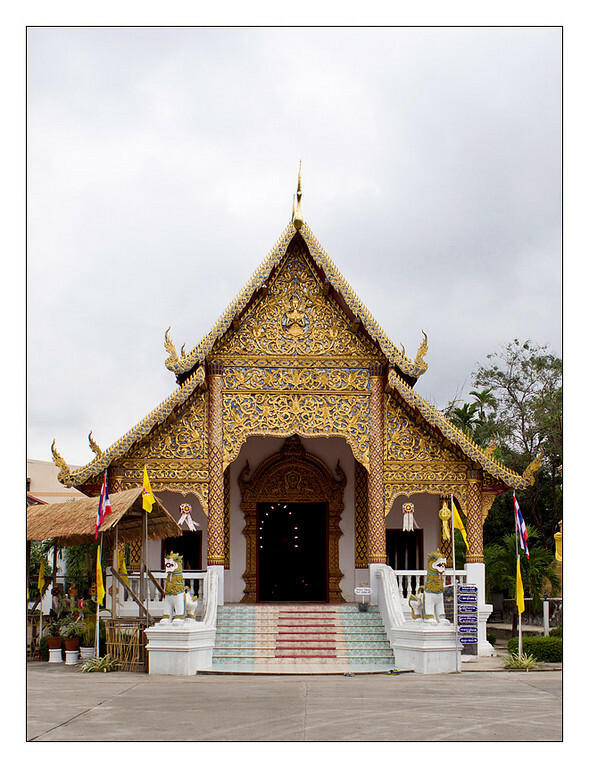 The place we're staying, Ruen Come In, is first and foremost a culinary destination and it well known in the area for their excellent northern Thai cuisene. Dinner did not disappoint, our hostess was more than willing to make suggestions and we ended up with green curry with fish balls and eggplant, deep fried fish with fried garlic, massaman curry with pork a plate of house made pork sausages. I only are the fish dishes but they were excellent. If I were to make one complaint it would be that we had too much food. It was so good that we were loath to stop eating but at some point we decided that cleaning our plates was a lost cause. We thanked our hostess and returned to our room to have an early night. 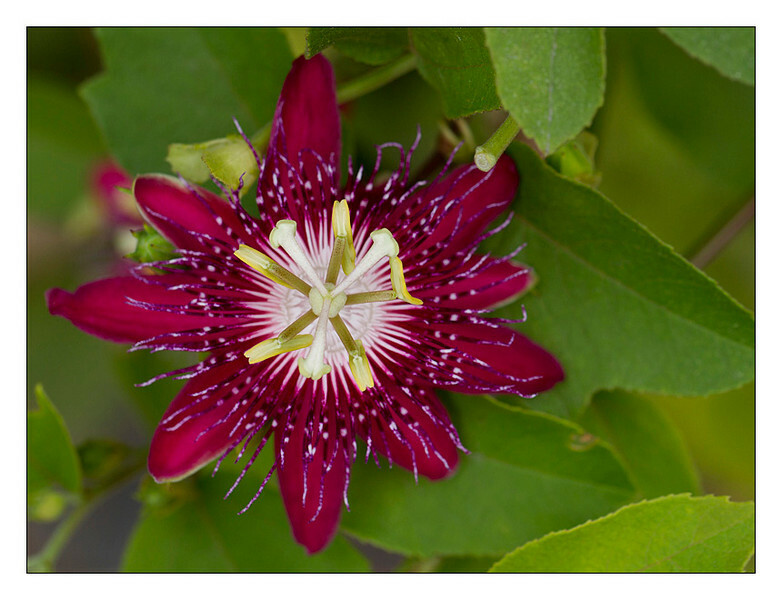 awesome shots of all the flowers. jealous. very.